If you have read my blog at all… you know I like things that are easy and/or simple. My kids love to do crafts but I am horrible at them. Just awful. I can have a great vision but it never seems to turn out that way. But, my kids? They are pretty good. They apparently get their crafting skills from their MaMaw (my mom). So, whenever they come up with an idea I just let them run with it. I give them the supplies they need and they get it done. I absolutely love that about them. Well, we have used the same Christmas Countdown Chain for about 5 years now. Each year we hang it up, tape the loops back in place, and then remove the loops each day before bedtime. We know when we near the top that Christmas is close… and that very last loop hanging represents Christmas Eve. Oh what a glorious day that is! 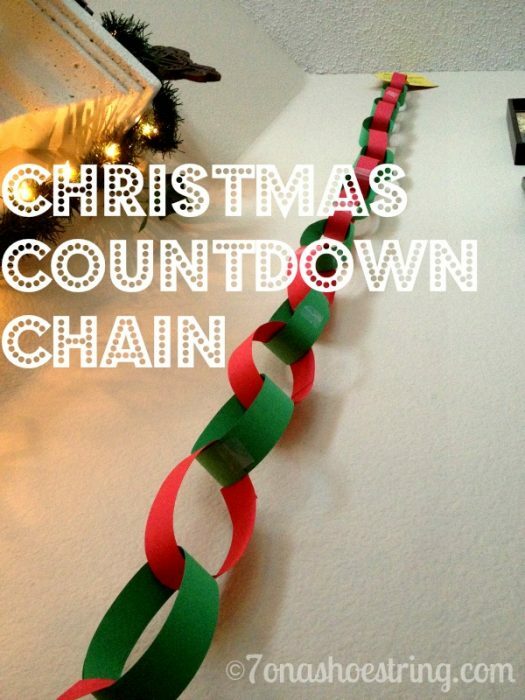 Anyways, our poor countdown chain has seen its last Christmas. The strips of paper are worn thin and really do not hold the tape well anymore. So, this year we have retired it and made a new version. Therefore, in my true crafty form… here is our latest craft. 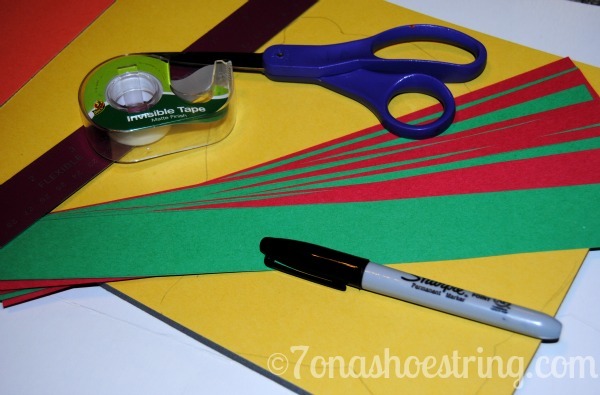 Using a ruler, mark the green and red construction paper into 1″ strips and then cut. 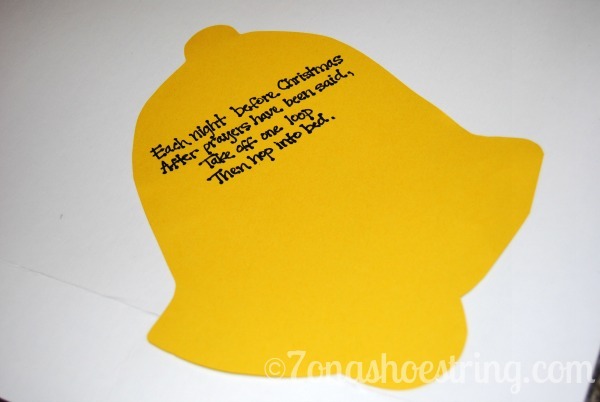 Draw or trace a bell, star, or other shape on the yellow construction paper and cut out. Write your own countdown poem or saying on the top shape. We had one that simply said, “Patiently waiting on Christmas.” This one we changed up a bit and I will type the entire poem below. Then cut a slit into the bottom for feeding a loop through. Loop one strip of paper through the bottom of your shape and tape. Continue with the rest of the red and green strips of paper (alternating as you go) until you have the correct amount of loops for days until Christmas. My 9 year old, our crafter and event planner, even puts up a calendar next to our chain. But, not to help countdown… to keep a weekly chore chart for taking off a link. Yes, it is that big of a deal around here. So, in order to keep them from arguing over whose turn it is… she does this. See? Always easy peasy with me! You come to the bell! Enjoy crafting with the kids! What is your favorite Christmas craft?